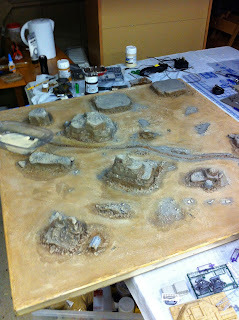 Rottenlead: 15mm Terrain Work Continues for Salute. 15mm Terrain Work Continues for Salute. Here are some photos from this weeks Sunday garage-workshop session. It was a long session and a lot of painting was completed. 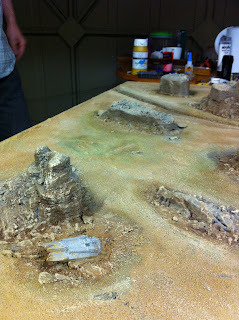 @inrepose, @internalclock , @neilcford and Russ all turned up to help paint and work thought the detailing stages of the terrain. There are still another 3 weeks work here, with super detailing, some static grass to apply to the desert layout and additional drop on buildings and models to create. 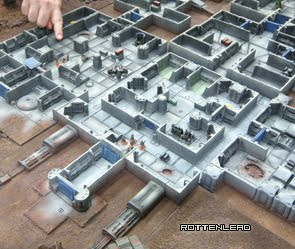 The Mesa resin terrain from Critical Mass Games was used on the first layout below and is a great way to rapidly put a rock restricted fire table together for Battletech or any other 15mm / 28mm gaming. I have integrated them into the board for a diorama type feel, however the resin mesa could be painted on their own and used as drop on terrain that can be moved around for different layouts. 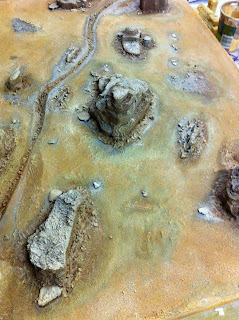 Desert Terrain. Base sand colour and initial drybrush applied. Some use of Mig pigments "dark brown" applied to the sides of the Mesa. The two flat Messa toward the back of the board are going to hold an integrated landing platform. Using lighter brown MIG pigment to blend some of the edges of the initial dark brown. If you use water to apply the pigment it will allow you to re-blend again when you apply the lighter pigment. Once these pigments are applied additional dry-brushing will bring out the texture again, whilst leaving the shading and tones on the board. A small crashed space vessel. This is a model from Dark Realm miniatures. It will be painted and detailed with some dark burn marks behind the engine in the sand. 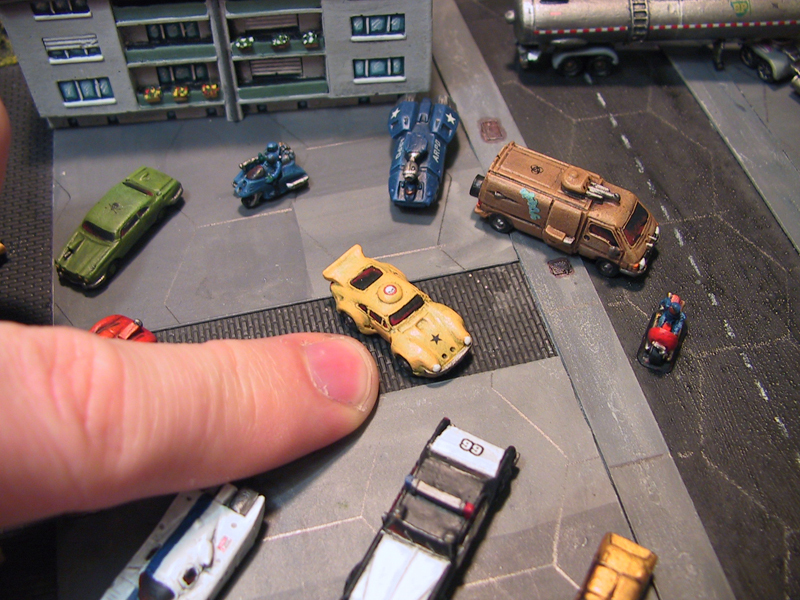 It is a 6mm scale sci-fi model (epic scale) but it will look like some sort crashed drone in 15mm. I will probably also use the board for 6mm gaming. Small details adds some interest to the layout and when painted it will draw the eye into the detail. 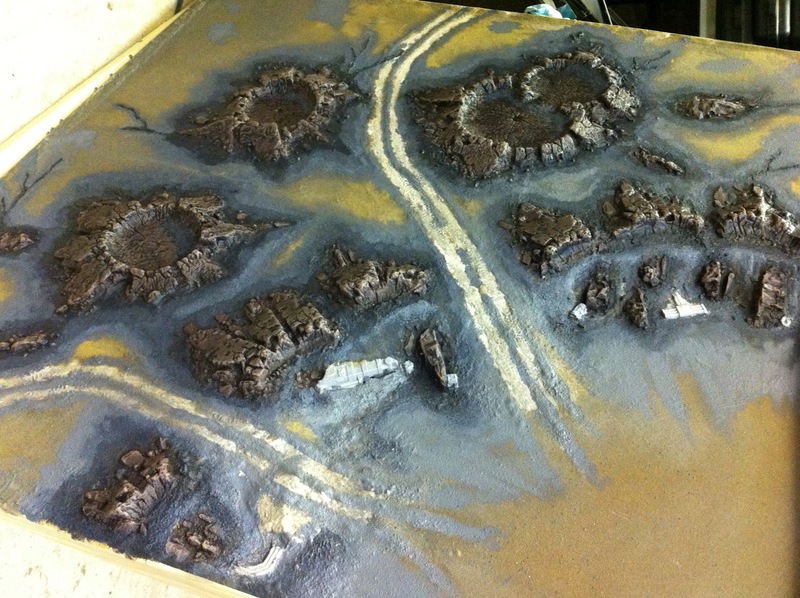 Starting to paint the ash waste terrain with craters on the separate board. Just the first edges in darker grey have been added and full grey layer will be applied and will also blend in the darker areas.